The Relay Function Module is a member of the Linx pre-certified OEM product line. The modules have been tested for FCC and Industry Canada compliance and can be quickly customized to meet a specific OEM's labeling requirements. This greatly reduces the time and expense of bringing an RF-based product to market. The Relay Function Modules provide four latched or momentary relay outputs that are capable of switching external AC- or DC-powered loads of up to 5 amps. The Relay Modules incorporate a Linx LR Series receiver and an on-board Holtek decoder IC. 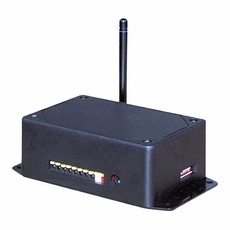 Selectable addressing provides security and allows the creation of 256 distinct transmitter / receiver relationships to avoid unwanted interaction when multiple systems are in use. When paired with a compatible Linx OEM Handheld transmitter or transmitter module, the Relay Function Module serves as a reliable wireless switching device at distances of up to 1,000 feet.